My time at Northwest Trek was awesome. I highly recommend going there, because there is lots of fun you could have by yourself or with your child. For example, Zip Wild is awesome. 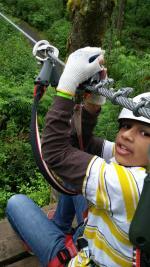 It’s not just zip lines, it’s tons of obstacles that you need to pass through. If you bring a kid, I recommend you do the lowest level of obstacles. But if you travel alone, I recommend you should do the hardest level. But remember this tip: you have to be eighteen or older to go on it. And it is totally worth the price. Next you get to see the animals; the animals aren’t just for kids. My mom was amazed by the animals and she thought it was really cool. I also recommend bringing a camera to this awesome place. There are some really cool things you could do and some really cool animals. Personally, my favorite animal is the wolverine. But there are tons of animals you could see and also pick out your favorite one too. And if the Mama’s not protecting them, you get to see the beaver babies! Then after that you could go on the Tram. The Tram is like a bus that they drive around the animals and see where they live. It’s also super cool because you get to see the black tailed deer, the goats, and you get to see the bison’s new babies; they are super cute too. When you’re on this ride get ready, because some of the animals get really close to the bus and you could take a very good picture. And you get to explore how these wonderful animals live their lives there, which is so amazing. Then there is the kid’s trek. For this, you need to bring a kid that is probably under eight with you because he or she is going to love this place. There is this castle and inside there are nets that you climb up. Or you could climb up the other side of the castle which also has nets. Then there is a place with logs and a log house that they could go in. And at the top, there is a slide that you could go down in; it’s not that long but it’s really fun. I even did some of it and I, at age eleven, thought it was pretty fun. Then the last thing that is worth the pay is the train. 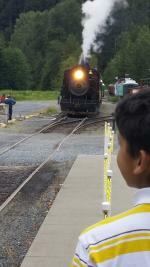 The train is called Mount Rainier Railroad. The train ride is forty-five minutes but it’s totally worth the wait. And you get to see the rivers and nature itself! I think that’s cool and you might too. The train has two sides so if you don’t want to sit on the one side you can freely move to the other side. And the best thing snacks! They have candy, popcorn which I had which was really good and they have drinks so while you’re waiting for the tram ride you could at least eat and drink something. The train is to a train museum. The train museum is so cool! There’s a bunch of old trains that you get to look at and admire. Then there’s this one train were you can actually go inside. It’s cool because you get to see where the guy in front gets to sit. And there’s a bell that you could ring like an actual train. Then once you’re done you go back, but you still get to see the awesome nature around you. This was my awesome time having fun at the Northwest Trek, I highly recommend you go and it’s totally worth the price for it. I really enjoyed my day there and I hope you will too.